At Toasted Coffee & Kitchen, toast is not just for breakfast anymore. 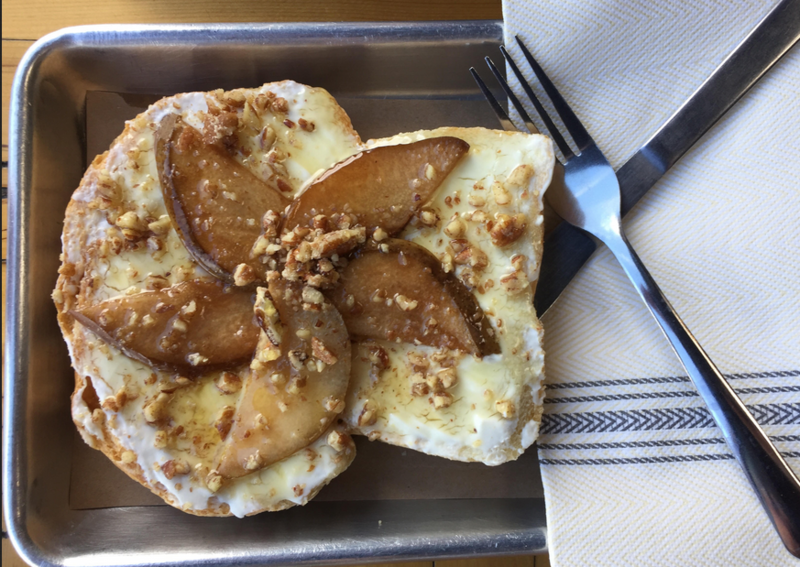 As the name suggests, Toasted brings the trendy toast sensation, and much more, to Dallas. Despite what you may think, Toasted is not just a great breakfast café, but it has offerings to satisfy any meal of the day. In addition to their gourmet toasts, they offer soups, salads and specialty sandwiches. 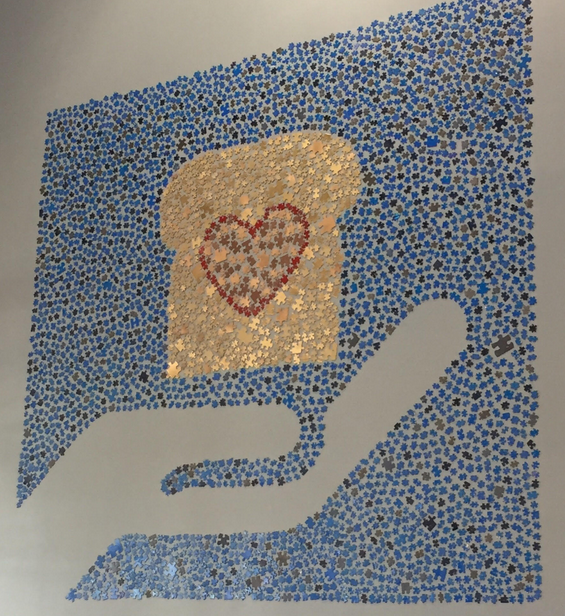 All toasts and sandwiches are served on fresh baked bread that is made in their in-house bakery. To quench your thirst, you can choose from multiple coffee and espresso drinks, teas, and even a full bar! My guest and I went to Toasted for brunch on a Saturday morning. We arrived to a busy and buzzing café with some customers brunching and sipping on mimosas, and others working on their laptops and drinking coffee. The atmosphere is cozy and casual as you walk up to the counter to place your order. Most of the entrees and drinks have punny names which makes the ordering process a little more fun and you’ll get a few laughs out of it! For our meal, we decided on three toasts: The All-Day B.A.E., A Toast to Gravy, and Toast Ma Goats. We also ordered a mimosa and A Little House on the Mary (aka: a bloody mary) because weekend brunch isn’t complete without a little booze! Each of the toasts are served on thick slices of delicious homemade bread. The All-Day B.A.E. 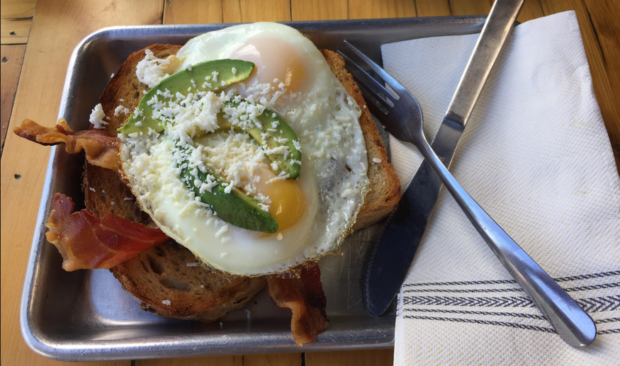 comes with a black bean spread topped with two sunny-side-up eggs, bacon, avocado slices and queso fresco. This dish covers all of the breakfast essentials. A Toast to Gravy is a twist on the traditional breakfast dish biscuits and gravy. 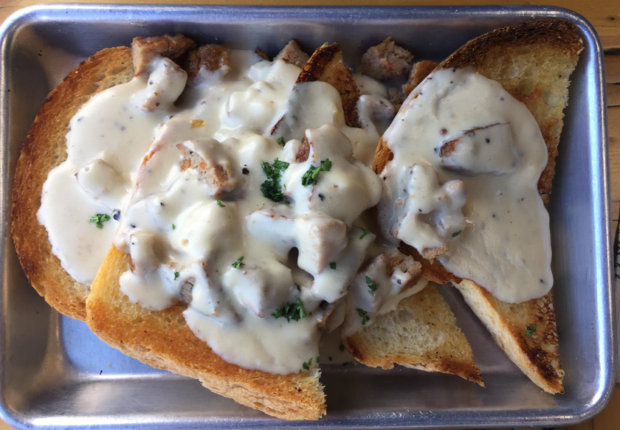 Toasted serves their dish with two thick homemade toast slices topped with bits of biscuits and slices of sausage, covered in a white gravy. If you’re looking for some comfort food and a filling meal, this will hit the spot! Lastly, we ordered a sweet toast to balance out our savory toasts. Toast Ma Goats included a spread of sweet goat cheese, pear slices and pecans, topped with a honey drizzle. I love anything and everything with goat cheese on it, so I must say this was one of my favorites! The beautiful presentation almost made it too pretty to eat, but don’t worry, I ate every bit of it. I have officially hopped on the TOASTed bandwagon and can’t wait to try the rest of the menu!